Dodder (Cuscuta spp. This annual weed that reproduces by seed starts as an independent plant but establishes a parasitic relationship with the host crop. At this point it has no chlorophyll and looks like yellow string. Control it long term by balancing the minerals in the soil. It can be killed quickly with hydrogen peroxide, fatty acid or vinegar products. Dodder (Cuscuta and Grammica), is a twining yellow or orange plant sometimes tinged with purple or red. Occasionally it is almost white. The stems can be very thin and thread-like or relatively stout Here's the information on this pest from the University of California. It's pretty good. Dodder, Cuscuta spp., is a parasitic annual plant that infests many crops, ornamentals, native plants, and weeds. There are over 150 species of Cuscuta found throughout the world (Africa, Asia, Australia, Europe, New Zealand, Polynesia, but most commonly in the Americas). The genus Cuscuta is in the Cuscutaceae family, but sometimes it is included in the family Convolvulaceae (morning glories). All dodders are parasitic, but the different species vary in their degree of host specificity. For example some species, such as C. salina, are found in rather restricted sites (salty marshes, flats, and ponds) on just a few host plants species. Other species, such as C. pentagona (C. campestris in some publications), are found on many crop and weed species including alfalfa, asparagus, melons, safflower, sugarbeet, tomato and pigweed (Amaranthus spp. ), lambsquarters (Chenopodium album), and field bindweed (Convolvulus arvensis). A third species, Cuscuta indecora, also has a wide host range that includes alfalfa and many weeds such as Russian thistle (Salsola tragus), field bindweed, lambsquarters, and five-hook bassia (Bassia hyssopifolia). Table 1 is a list of some ornamentals and vegetable plants that are susceptible to dodder. Dodder seed lacks obvious dispersal mechanisms and is likely spread by people through the movement of soil, equipment, or in mud attached to shoes and tires. Dodder seed may also be transported in infested plant material or be present as a contaminant in crop seed. Water may play a role in seed dispersal, particularly for dodder species near aquatic environments. Table 1. Some Common Ornamental and Vegetable Plants Susceptible to Dodder Infestation. Dodder species have slender twining or threadlike stems that vary in color from pale green to yellow or bright orange. They may be leafless or have small, scalelike triangular leaves about 1/16-inch in length. The bell-shaped flowers are cream colored and small (about 1/8-inch long), usually occurring in clusters but occasionally borne singly. Each flower produces a seed capsule with two to three seeds. Seeds have rough coats and vary in size depending on species but are generally about 1/16-inch in diameter. Dodder germinates at or very near the soil surface starting in spring when the soil temperatures reach about 60°F. Dodder germination occurs independently of any host plant influence. The germinating seed sends up a slender, twining stem that coils around any object, including host plants. Seedlings are yellowish, threadlike, rootless, leafless stems. They are dependent on carbohydrates stored in the seed (cotyledons) until they attach to a suitable host. When it contacts a host, the stem coils around the host plant and produces little structures called haustoria that penetrate the host's vascular tissue. The dodder plant begins to extract nutrients and water from the host, and its connection to the soil withers and dries. Although dodder is capable of limited photosynthesis, it obtains nearly all of its energy from the host plant. A dodder seedling can survive several days without a host, but if one is not found within 5 to 10 days, it will die. Dodder stems that have attached to a host plant have been known to survive for several days after being detached from the host plant. As dodder plants grow, they continually reattach to the host. When other suitable hosts are nearby, dodder shoots spread from host plant to host plant often forming a dense mat of intertwined stems. In shaded areas, twining and attachment are greatly reduced. Dodder flowers from late spring through fall, depending on the species, but seed set is highest in late summer and fall. Seed production generally begins near the site of initial attachment and proceeds outward from this point. Dodder is a prolific seed producer; each plant is capable of producing several thousand seeds. Generally only about 5% of the seed germinates the year following its production; the remainder of the seed can remain dormant, yet viable, in the soil for more than 20 years, depending on the species and environmental conditions. Dodder's long dormancy is thought to be largely a result of its hard seed coat. To break seed dormancy, scarification is generally required. In nature, this probably occurs through soil microbial activity, weathering, and other natural disturbances, such as fire or grazing. In managed settings, scarification likely occurs when fields are cultivated. Native plants, ornamental shrubs, trees, groundcovers, and crop plants can be infested with dodder. The bright yellow stems of dodder can be readily seen against the foliage of the host plants. 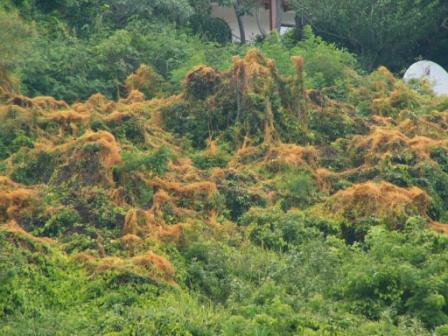 The impact of dodder varies from moderate to severe reductions in growth of the host plant and, in some instances, may result in complete loss of vigor and death. The severity of an infestation depends on the growth stage of the host plant at the time of initial dodder attachment. The greatest growth reduction occurs when dodder attaches to seedlings. Established host plants are usually not killed by a dodder infestation, but when multiple attachments are made to the same host plant, death can occur. The weakened state of infected plants also predisposes them to losses from other maladies such as disease, insect, and nematode invasions. The most successful control of dodder involves a systematic approach that combines several methods; dodder usually cannot be eliminated with a single treatment or in a single year. When dodder is detected infesting landscape and garden plants, immediate action is needed to eliminate or reduce the infestation in these locations. Effective management requires control of the current population, the prevention of dodder seed production, and suppression of new seedlings in subsequent years. Where extensive infestations exist, remove the infested host plants and replant with nonhosts, or in vegetable gardens rotate to nonhost crops for several years. Once a host crop is planted again, any new dodder plants must be removed as soon as possible. The use of dodder-free planting seed has long been a primary means of preventing the spread of dodder infestations. Many countries and states have seed laws that prohibit the presence of dodder seed in planting seed. Clean and inspect clothing and equipment before moving from infested to "clean" areas. Once an area is known to be infested, it must be managed to prevent the further production of dodder seed. Isolate small infestations and remove them by hand before seed is produced. Monitor larger infestations and mow, prune, burn, or spray herbicides to prevent seed production. Planting nonhost plants can be an effective means of managing a dodder infestation. Plants that are not hosts of dodder include grasses (e.g., corn) and many other monocots (e.g., lilies). Plants that grow primarily during winter (crucifers and legumes), as well as transplanted trees and shrubs that have bark, are usually good alternatives. Dodder cannot penetrate tree bark, but it can penetrate tree foliage, if it is able to contact it. Select plants that are nonhosts of the species of dodder present. Also, be sure to remove weeds in these plantings so that the weeds don't serve as hosts for dodder and increase the amount of dodder seed in the soil. Dodder seedlings are difficult to find, but if they are observed before they attach to a host, remove them by cultivation or by hand-pulling. If dodder is observed soon after attachment, prune the infected portion of the host plant 1/8 to 1/4 inch below the point of attachment, otherwise the dodder may regenerate from the haustoria left embedded in the host plant. Pruning of trees and shrubs generally has been of little benefit unless dodder is confined to one or two branches that can be removed without destroying or disfiguring the whole host plant. If no host plants are present, cultivated dodder plants can be left on the soil surface to dry and die. However, if freshly removed dodder is allowed to contact a healthy host plant, a new connection sometimes occurs. If the dodder plants have set seed, remove the plants from the area to prevent future infestations. Place plants in a plastic bag and dispose of it in the trash. Dodder seed has been observed to survive soil solarization, probably because of its hard seed coat. Although composting studies have not been conducted, it is believed that composting would kill most dodder seed because higher temperatures are reached in the composting process than in solarization. In agricultural settings, cultivate dodder before it attaches to a host plant; if cultivation is done after dodder attaches to the host, it is of no benefit. Hand-pulling, cutting, or mowing can also reduce dodder infestations. The host plant must be broken off, cut, or mowed just below the point of dodder attachment (about 1/8 to 1/4 inch) for these methods to be effective. Close mowing is an effective management tool for dodder in alfalfa. Burning reduces a dodder infestation as long as the invaded tissue of host plants is destroyed along with the dodder to prevent regeneration of the dodder from embedded haustoria. Burning kills only some of the dodder seed; the amount of seed destroyed depends on the duration and intensity of the fire. Several disease organisms are known to infect dodder, including Fusarium tricinctum and Alternaria spp., which attack swamp dodder (C. gronovii) and Alternaria alternata and Geotrichum candidum, which attack field dodder (C. pentagona). Researchers in China have found that a conidial suspension of Colletotrichum gloeosporioides can selectively control Cuscuta chinensis and C. australis in soybeans. Difficulty in culturing and applying these organisms has limited their use or commercialization. Breeding programs aimed at developing dodder-resistant varieties are not known to exist, however, some varieties of normally susceptible species have been reported to have some resistance. For example, several varieties of processing tomatoes, a plant that is generally susceptible to dodder parasitism, have been observed to be either totally resistant or tolerant to dodder attack. Generally chemical control is not necessary in the home garden and landscape; dodder can be controlled for the most part with cultivation (seedlings), hand-removal, or pruning. If cultivating seedlings is not possible, the dodder seedlings can be sprayed. In the home garden, household vinegar (acetic acid) can be used. Commercial preparations of pelargonic acid (Scythe) are also effective. In commercially managed landscapes or in agricultural crop situations, only commercial products can be used. Acetic acid and pelargonic acid act as contact herbicides that kill the plant tissue they contact; consequently good coverage and careful spraying (so that desirable plants are not damaged) are important. Where dodder has been a persistent problem in certain commercial agricultural fields or in landscapes, preemergent herbicides (e.g., trifluralin) can be applied before the dodder seed germinates and, where practical, followed with close mowing, burning, or spot removal of parasitized host plants to control dodder plants that escape the herbicide application. Generally, postemergent herbicides, which are applied directly to the dodder plant to control it, do not selectively control dodder without injuring the host plant and are not a good choice for controlling established infestations. Cudney, D. W., S. B. Orloff, and J. S. Reints. 1992. An integrated weed management procedure for the control of dodder (Cuscuta indecora) in alfalfa (Medicago sativa). Weed Technology. 6:603-606. Cudney, D. W., S. B. Orloff, and D. A. Demason. 1993. Effects of thiazopyr and trifluralin on dodder (Cuscuta indecora) in alfalfa (Medicago sativa). Weed Technology. 7:860-864. Dawson, J. H., F. M. Ashton, W. V. Welker, J. R. Frank, and G. A. Buchanan. 1984. Dodder and its control. Farmer's Bull. USDA. No. 2276. Dawson, J. H., L. J. Musselman, P. Wolswinkel, and I. Dorr. 1994. Biology and control of Cuscuta. Rev. Weed Sci. 6:265-317.